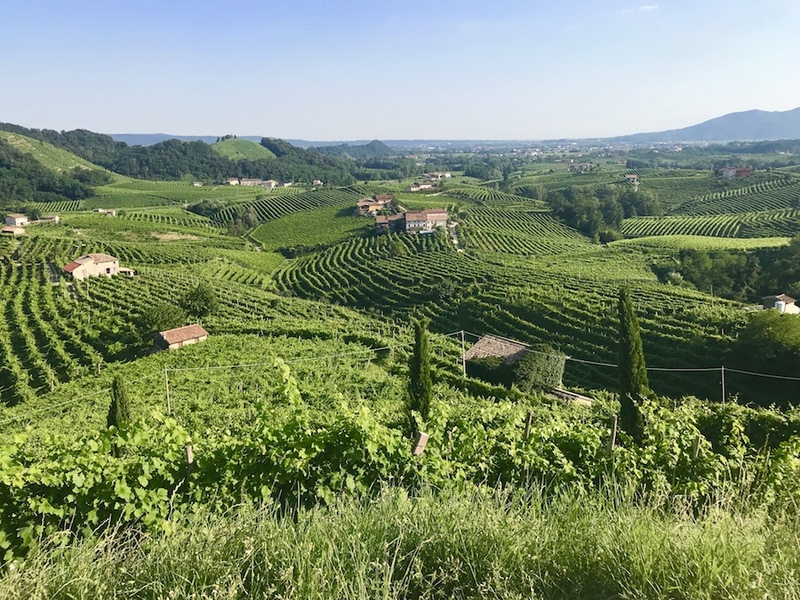 At over $1 million per hectare (2.47 acres), Cartizze Hill in Valdobbiadene is some of Europe’s most expensive agricultural land. 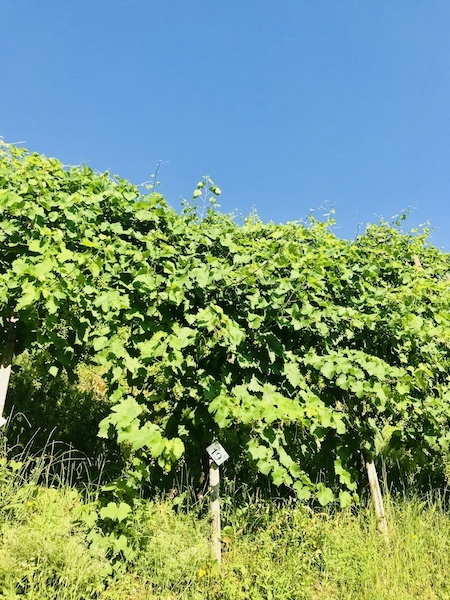 It offers the perfect combination of soil, acidity, sunlight, and water for Prosecco’s Glera grape to thrive. Plots of land on this hill have been passed down from generation to generation, and today, more than 200 wineries own at least a small portion of it. 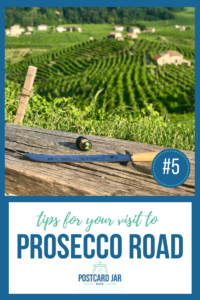 It’s the heart of the region and is considered the very best land for producing Prosecco wine. Vines on Cartizze Hill in Valdobbiadene are numbered to identify its ownership. However, people don’t visit Cartizze Hill just to pay homage to the home of a good wine. No, they visit because it is one of the most beautiful places in all of Italy. The beautiful view of the Italian countryside from Cartizze Hill near Valdobbiadene. Our hosts, Deb and Massi of Italy Unfiltered and Massi the Driver, made sure to take us there. We really had no idea what to expect, but felt content knowing we could take in the view and enjoy the setting sun. As we made our way down a well-traveled dirt path, we noticed the numbered and named rows that displayed the owners of each Glera vine. 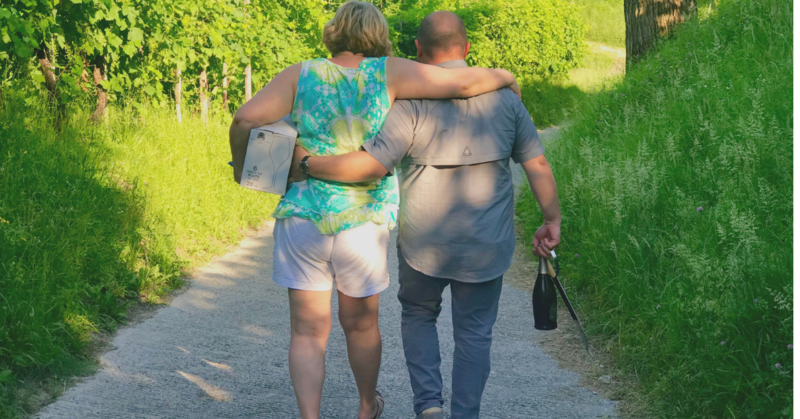 Deb and Massi make their way Cartizzi Hill with wine, wine glasses, and saber. Massi explained the prestige of owning grapes here. There is definite value in being able to harvest from this land which produces the world’s very best Prosecco. Yet, despite the limited amount of this valuable land, someone had still thought it important enough to carve out a spot for people like us to enjoy it. We loved that there was a little space carved out for visitors like us to sit on a bench and enjoy the view with a glass of Prosecco. Something tells me that in the U.S., this area would have been closed long ago. Instead, the land would be filled with a few more of the valuable vines. But here, old-world common sense still reigns supreme and people are more important than profit. In this place, anyone can just stroll out and sip a glass of this bubbly treat while basking in fresh air and the beautiful Italian sunset. Massi the Driver and his wife, Deb, took us to Cartizze Hill where they grow the very best grapes for producing Prosecco. When we arrived at the seating area on the hill, Massi had a surprise for us. First, he produced some wine glasses and a bottle of Prosecco. Then, he pulled out an actual, honest-to-god sword! He proceeded to open the bottle using the sabrage technique. This means he used the sword to open the bottle! Check out this video to see how that worked, and remember do not try this at home. 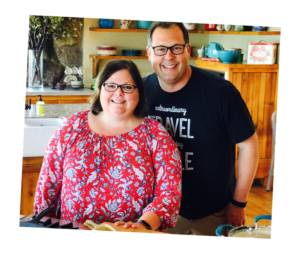 As Ann said, you just don’t do this every day in Nebraska, but you can do it on Cartizze Hill. 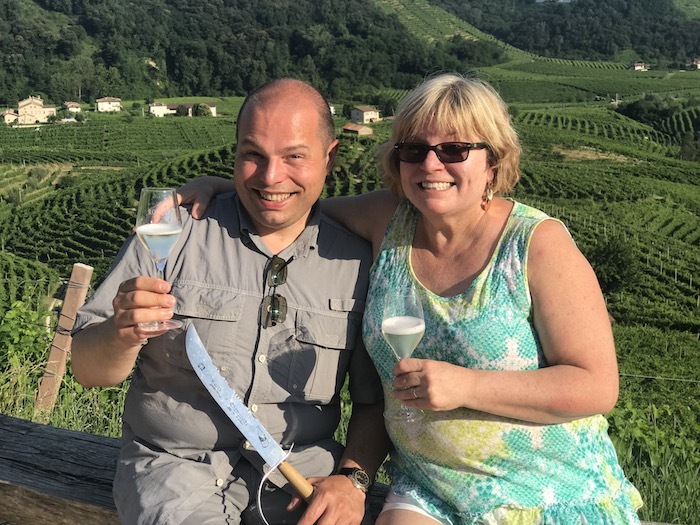 One of our fondest memories of our 2018 trip to Italy was toasting Prosecco with Massi and Deb at Cartizze Hill in Valdobbiadene. 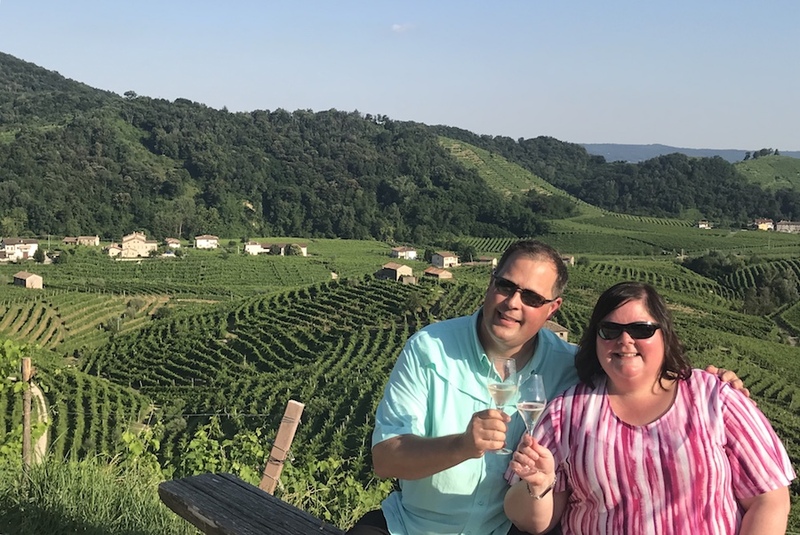 We absolutely loved our visit to Cartizze Hill. 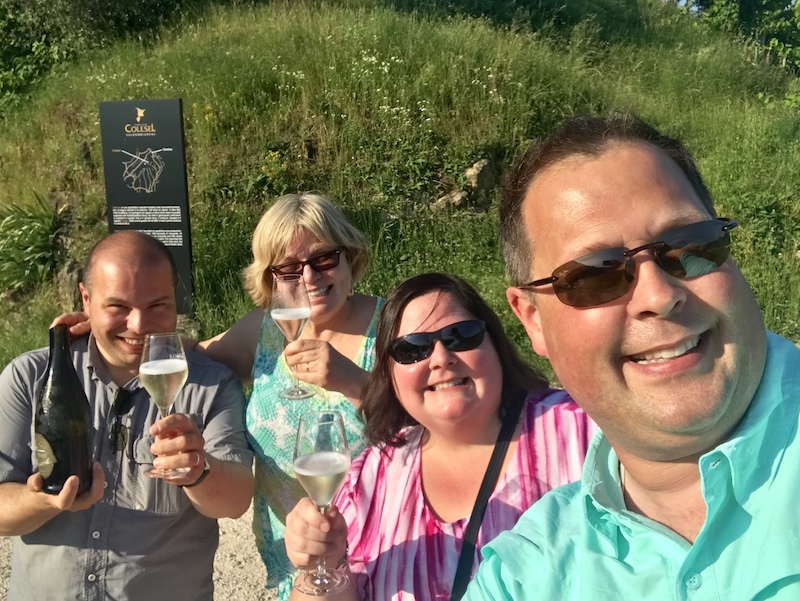 The heart of the Prosecco world, it offers farmers ideal conditions and visitors an unforgettable experience. Be sure to include a visit here on your visit to the region. Our tour and transportation services were complimentary from Italy Unfiltered and Massi the Driver. As always, the opinions expressed are our own. 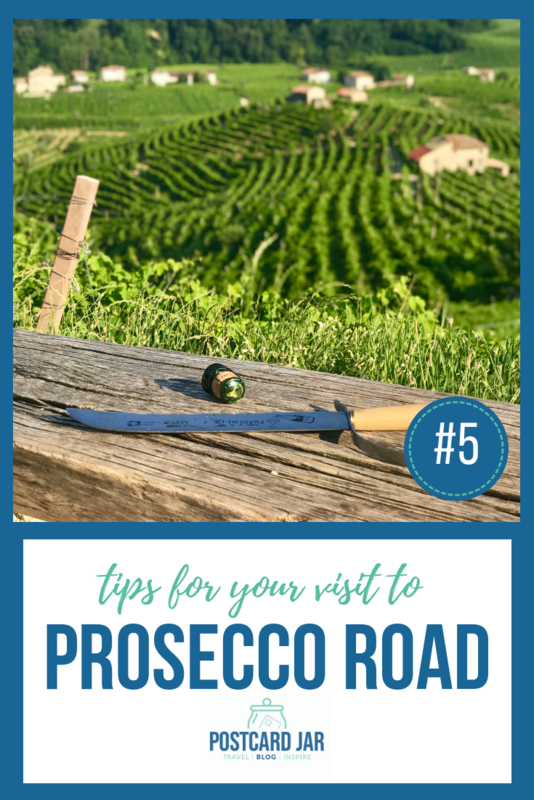 Tips for your visit to Prosecco Road – #5 Visit Cartizze Hill. This is a wow! Steve, as a fencer, maybe this “technique” should be added to your repertoire!!!!! (Love, Mom)!